I've been playing around with SharePoint 2010 visual web parts and I happened to find that one of my old—and deleted—sample parts was still (unsuccessfully) being loaded on the server. 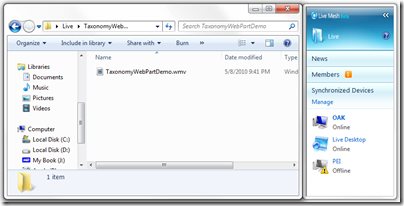 The web part did not exist on the page (at least it didn’t appear anywhere in published or edit more) and it had been deleted from the web part galleries. I stumbled across the error when I enabled the SharePoint 2010 developer dashboard on the home page of my server. The web part errors appeared in the “Asserts and Critical Events” section of the dashboard. To get rid of the error, I put the page in edit mode and removed all the white space (just a line break or two from the main content area on the page. (I also added and removed a different web part, but I’m not sure that it had any effect.) Now I don’t get the error… crazy. There will be a SharePint tomorrow in Halifax, Canada! For future events, follow @HUGSharePoint on Twitter and check out http://www.hugsharepoint.org. A while ago, I wrote a post about SyncToy. 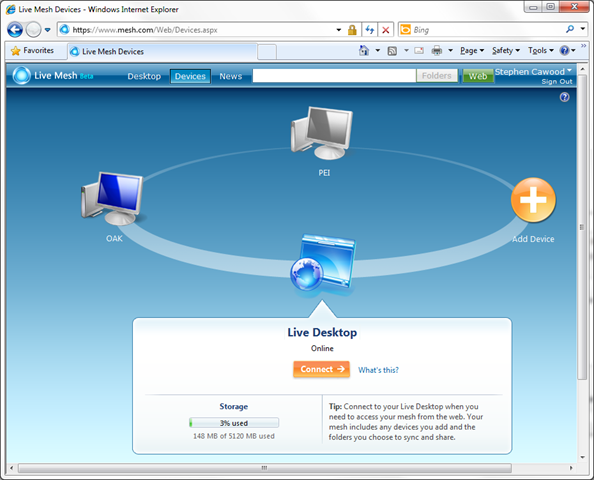 It’s a free utility that let’s you sync folders across computers. Well, now I have something even better to blog about. I switched over to Windows Live Mesh (Beta) a few months ago and I’m really happy with it. Live Mesh allows you to quickly and easily share folders amongst machines that have network access. All you have to do it install a small app and then create folders. In the Beta, you get 5GB for free and both 32bit and 64bit machines are supported. I was particularly happy to find that Windows Server 2008 R2 64bit works because I’m a SharePoint guy and that’s what I run at Metalogix. Once you have set it up, you can rest easy as the folders are synchronized in the background. For example, I just went to the Microsoft TechEd conference and I knew getting on the plane that my laptop was in sync with my shared folder at work. In a sense, Live Mesh is like a USB key that you don’t need to carry with you. 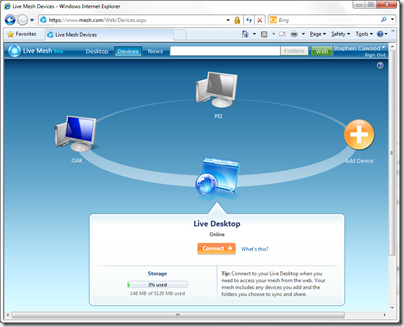 Also note that Live Mesh offers a remote desktop option that allows you to remote to the computers that are being used. This adds tremendous value since most networks use DHCP and you can't be sure which IP to connect to unless you install something like DynDNS. In other words, connecting to work might be easy, but connecting to home can be more of a challenge; Live Mesh resolves that challenge.